Internists specialize in the diagnosis and treatment of chronic diseases in adults like hypertension, diabetes, reflux, thyroid disease, stroke, heart disease, gout,arthritis, high cholesterol and many more. Internists also treat common conditions such as sinusitis, strept throat, influenza, ear infections, pneumonia, etc. We perform yearly physical examinations, EKG, Doppler Studies, and offer same day sick appointments. We limit the number of insurance plans that we participate with in order to be able to provide the time required to provide individualized, quality care. As a courtesy, we submit insurance claims for out of network patient visits. Most out of network patients find that having their own private physician who knows them and is available when they are in need, is worth the occasional expense. Obesity Medicine is a relatively new specialty in Medicine and a much needed one. Obesity is becoming the leading cause of preventable death in the United States and 40% of the adult population is considered obese. 60% of the population is overweight. It is high time that physicians begin to pay more attention to this growing health threat. Dr. Bonilla has practiced Obesity Medicine for over 25 years and is Board Certified in the specialty. Many of the conditions that Internists treat are caused by being overweight. Dr. Bonilla has made it a priority to help his patients understand that maintaining a healthy weight throughout their lives is critical factor in their overall health. Part of his practice is devoted exclusively to weight management and he has helped thousands of patients lose weight and maintain a healthy weight. Dr. Maurice Bonilla was born in Colombia, South America. He is bilingual in Spanish and English. He grew up in Detroit, Michigan and graduated from Oakland University in Rochester, Michigan. 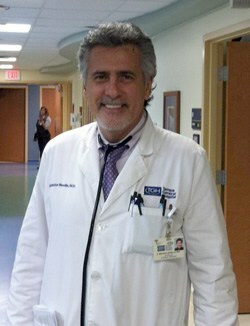 Dr. Bonilla completed his medical studies in Mexico, at Universidad Autonoma de Guerrero in 1981. He completed a three year residency in internal medicine at Oakwood Hospital in Dearborn, Michigan as well as a one-year fellowship in Gastroenterology at Wayne County General Hospital, (affiliated with the University of Michigan). He worked as an Emergency room physician at various hospitals prior to opening his private practice. Dr. Bonilla relocated to Tampa in 1985 where he began his private practice. He is Board Certified in Internal Medicine, Geriatrics and Obesity Medicine. As a pioneer in weight management, he has helped thousands of men and women to lose weight and keep it off. Formerly Chief of Internal Medicine at St. Joseph’s Hospital, he has been honored to appear in various publications such as Top Doctors In America, U.S. News and World Reports’ Top 1400 Internists, Best Doctors in Florida, and Guide to Top Doctors. Dr. Bonilla has resisted the temptation to join a big group or move to a hospital based practice because he believes that there is still a need and a demand for the private, personal, physician who really gets to know his or her patients.